An olefin-based additive that is halogen-free and all-polymeric in nature allowing host resin properties to be retained while improving wear resistance compared to particulate-based additives. It’s easy molding and ideal for external parts that require an excellent surface or color appearance. Marketed by DuPont as Fluoroguard®. Is an innovative, internal lubricant that imparts excellent wear and low friction properties while maintaining compound physical properties. 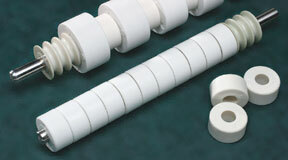 Minimizes or eliminates “plate-out” associated with PTFE, functions like a mold release, and increases extrusion throughput. Lowest coefficient of friction of any internal lubricant. Forms a lubricious film on part surface. Modifies mating surface after initial break-in period. Facilitates higher dynamic load bearing capability. Acts as a boundary lubricant because it migrates to the surface over time. As a partial alloying material with the base resin, some of it remains in the compound over its service lifetime, reducing start-up wear. Creates a harder and more wear resistant surface in nylons. Ideal for applications where nylon wears against metal, as it fills metal’s microscopic pores and creates a smoother metal surface. Its molecules slide easily over one another with little friction, especially in aqueous environments. Ideal for underwater applications. Softer and less abrasive than carbon or glass fiber, this additive is most commonly used for reduction in the wear of the mating suface, especially softer materials. Improves mechanical and thermal performance which translates into higher PV limits. Strengthened compounds may have lower friction coefficients than the base resin. Unlike glass, carbon is softer and less abrasive. Some carbon fiber compounds can dissipate static electricity. Improves mechanical and thermal performance. Increases coefficient of friction and mating surface wear (which can be decreased through the addition of lubricants). Request your copy of our Wear Resistant brochure today! Learn more about methods and benefits of lubricating plastics and the process of having a specialty compound formulated for your application’s requirements.